The valour of Spain of the ancient days is now altered into a country with a leisurely, calm environment. A place where traveller’s are welcome from anywhere around the world. Despite being known for its beautiful sandy beaches, Spain is more than that with its ice-capped mountains, green lands, historical cities, and noble demonstration of art and architecture. There are fiesta celebrations at anytime in the country, with many fabulous activities to appreciate. Moreover, the country offers travellers a variety of delicious cuisines full of aroma and mouth savouring tastes too. Contrary to other European countries, Spanish lifestyle is more tranquil. People spend a lot of time with their families, and they are also very traditional: they love festivities and celebrations. A lot of fiestas are observed throughout the year, during which local people dress up in traditional costumes and celebrate until fall, with sangria, wine, beer, and famous Spanish food. The different landscapes give extreme climate conditions, which are considerably affected by the Mediterranean Sea that borders the country from the south to east. Most places can be extremely hot during the summer and very cold during winter. Rainfall occurs intermittently during spring and autumn and heavy snowfalls are banal in winter. Usually it's good to travel during the months of April to November, while the climate can get disagreeable in July and August. Modern apartments located at 250 metres from Ciudad Lineal Metro Station, where you can reach central Madrid in 15 minutes. Madrid Barajas Airport and the IFEMA Conference Centre are a 10-minute drive from the apartments. Alcalá 525 Golf Course..
Property Location With a stay at Apartamentos APR Numancia in Madrid (Puente de Vallecas), you'll be close to Royal Tapestry Factory and Prado Museum. 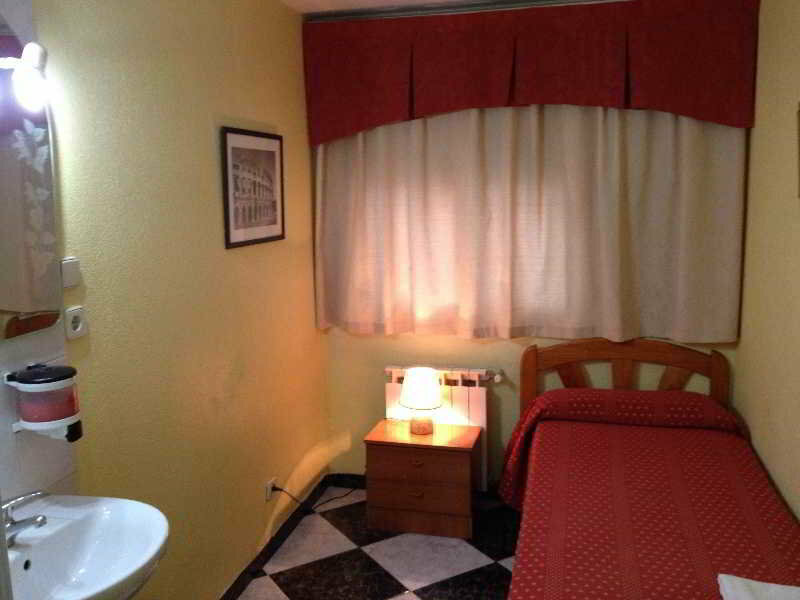 This aparthotel is within close proximity of Madrid Railway Museum and Crystal Palace. 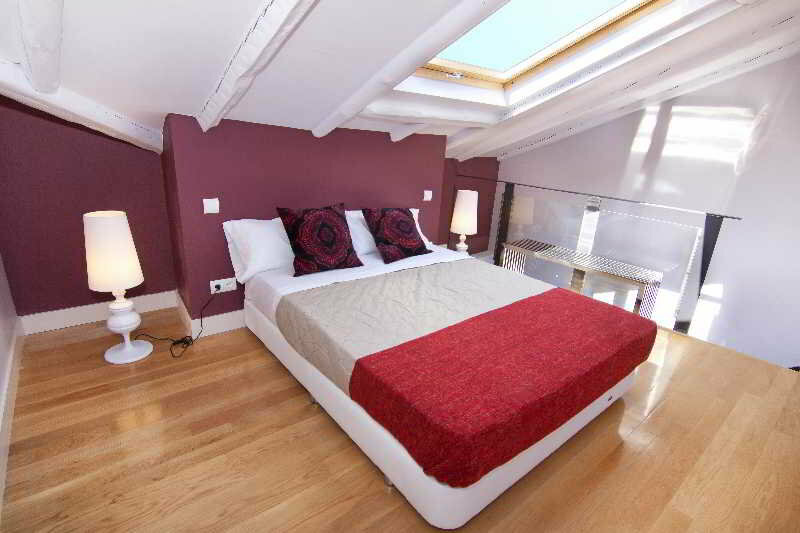 Rooms Make..
Charming Touristic Apartments for 2 people located in the centre of Madrid. All our apartments have a doubled bed. The dinning-room has a comfortable sofa to rest, TV and a fully-equipped kitchen. Bathroom has shower.Camino del Prado Studios has also.. 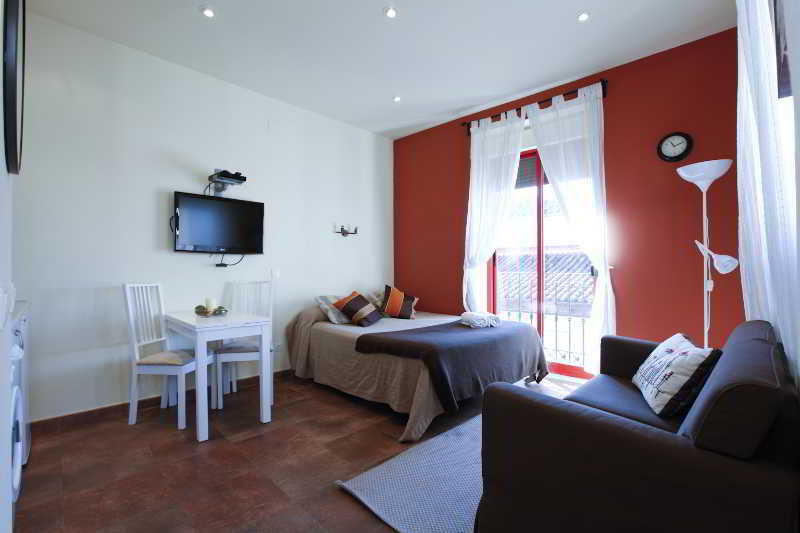 This hostel is situated in Alcala de Henares . The hostel is located just a 5 minutes' walking distance away from the historical centre of the town. Guests will find themselves just 300 metres away from the Alcala de Henares train station. Madrid Barajas.. 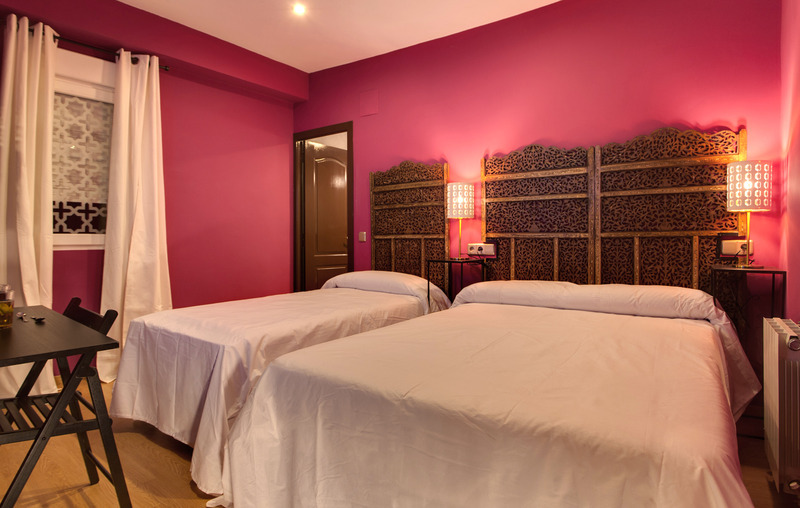 The hostel is located in the elegant Salamanca district of Madrid. All rooms have air conditioning, bathroom with toiletries and a flat-screen TV. There is an area of Wi-Fi and a lounge with TV and newspapers. It is just 200 metres from the metro Velázquez.. The Hostal Salamanca debuts new look to offer an unforgettable stay in the prestigious Salamanca district, the comercial heart of Madrid. It aesthetic combines perfectly with the service you will receive by our team. Each room is different, but all of.. The Leganitos Apartments offer elegant and functional accommodation just minutes from the main attractions of the city. Located on Leganitos street, very close to Gran Via and its multiple offer of theaters, shops, restaurants. All apartments have been.. 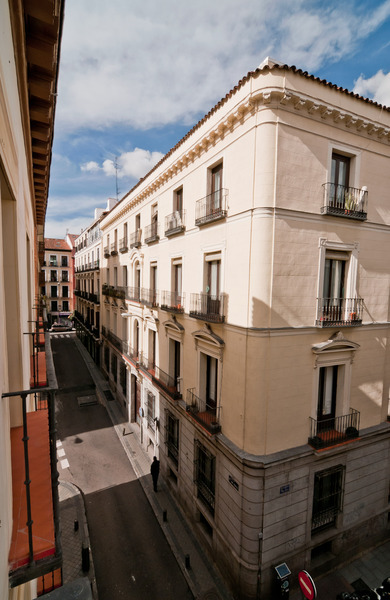 This apartment complex enjoys a wonderful setting at the heart of the vibrant city of Madrid. Steeped in history and culture, the area enjoys a wide range of prominent attractions. Guests will find themselves just a 5 minutes' walking distance away from.. These lovely, stylish apartments feature a privileged location in Madrid's Chueca district, just a few steps from the nearest metro station. It provides easy access to some of the most important tourist attractions, such as Gran Via Avenue, located some..
Motorcoach Tour (Seat on a bus N°271) 7 days / 6 nights Itinerary: Madrid - Cordoba - Sevilla - Granada - Toledo - Madrid Click here to learn more about this escorted tour! ESCORTED TOUR - Madrid - Galicia Motorcoach Tour 8 days / 7 nights Itinerary: Madrid - Astorga - Lugo- A Coruña - Santiagi De Compostela - Rias Bajas - La Toja - Vigo - Salamanca - Madrid To learn more about this escorted tour,..
Motorcoach Tour (Seat on a bus N°295) 8 days / 7 nights ITINERARY: MADRID - AVILA - SALAMANCA - CIUDAD RODRIGO - COIMBRA - FATIMA - OBIDOS - LISBON - CACERES - MADRID Click here to learn more about this escorted tou..
Motorcoach Tour (Seat on a bus N°296) 12 days / 11 nights Itinerary: Madrid - Avila - Salamanca - Ciudad Rodrigo - Coimbra- Fatima - Obidos - Lisbon - Caceres - Sevilla - Ronda - Costa Del Sol - Granada - Toledo - Madrid Click here.. ESCORTED TOUR - MADRID - ANDALUCÍA – MEDITERRANEAN COAST – BARCELONA Motorcoach Tour (seat on a bus N.319) 12 days / 11 nights Itinerary: Madrid - Cordoba - Sevilla - Cadiz - Jerez - Gibraltar - Costa Del Sol - Granada -.. ESCORTED TOUR - Madrid - Andalusia - Levante - Barcelona Motorcoach Tour 10 days / 9 nights Itinerary: Madrid - Cordoba - Seville - Granada - Alicante - Valencia - Barcelona - Zaragoza - Madrid To learn more about this escorted..
Six worlds filled with surprises await you in PortAventura. Each area features an abundance of rides, shows, shops and themed restaurants. You'll enjoy incredible shows, full of colour, imagination, music, dancing ... and of course the best.. ESCORTED TOUR - PORTUGAL AND SPAIN Motorcoach Tour (seat on a bus N.315) 16 days / 15 nights Itinerary: Lisbon - Ceceres - Seville - Ronda - Costa del Sol - Granada - Alicante - Valencia - Barcelona - Zaragoza - Madrid - Avila..
PORTUGAL - MADRID - NORTE DE ESPAÑA Motorcoach Tour (Seat on a bus) 16 days / 15 nights Itinerary: LISBON - CACERES - MADRID - ZARAGOZA - SAN SEBASTIAN - BILBAO - SANTANDER - OVIEDO - GIJON - CUDILLERO - LUGO - LA CORUÑA..